With the World Series over, we transition now into the offseason. For fans of struggling franchises and championship contenders alike, now is the time to dream of ways one’s team might be improved. This year’s free agency offers some tantalizing bargains mixed in with some dangerous pitfalls, none more hazardous than 2014’s surprise breakout players. It’s important to keep in mind, no matter your team, that a free agent pickup is a contract for a player’s future services, as opposed to their past record. It is easy to conflate the two, in part because past performance is the best, most useful guide for predicting future success. The key is that all of a player’s past performance must be considered, and not just the most recent at-bats. Humans are ever-eager to disregard the more distant past, especially in service of building a "breakout" narrative. Consequently, whenever a player shows marked improvement at the plate, it’s tempting to believe that they’ve reached a new normal, a plateau of increased skill from which they won’t soon fall. This belief is an insidious example of recency bias, whereby we ascribe too much importance to the most recent of our observations. Meanwhile, our brains pretend that years of perfectly valid previous data can be discarded. 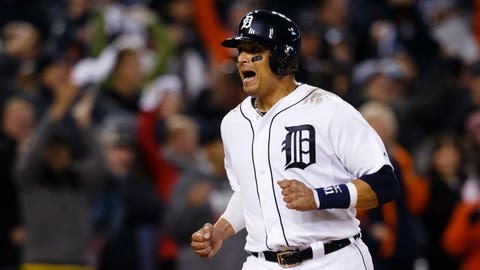 Victor Martinez is an instructive example of this phenomenon in action. Prior to the season, Martinez was forecast for a .280 True Average, or TAv (Baseball Prospectus’ all-in-one batting statistic), perfectly in line with his mark in 2013 (and indeed close to his statistics in the three years prior to that). Of course, V-Mart exploded to the tune of a more impressive .335 mark, putting up a total of 4.8 WARP and making a case for being perhaps the best hitter in the American League. Martinez’s breakout was suitably astonishing, and most were willing to dismiss it as lucky for the first few months of the season (for the record, I believed in him early on). But Victor Martinez is also 35 years of age, and a pure hitter with no defensive position. His impending free agency will no doubt beget a hefty contract, but it is unlikely he will continue to perform like this season’s edition. We have four consecutive prior years of data to suggest he’s something like a good, maybe even a great hitter, and then one aberrant, miraculous year in which he tore the cover off the ball. This year shades his forecasts towards greatness, but it likely doesn’t set the pace for all Victor Martinez seasons to come. To illustrate, I gathered players from 2013 who had exceeded their projections by similarly high levels in order to see how they’d performed in the subsequent year. At Baseball Prospectus, we use PECOTA to predict how hitters will do, and so I took all position players who exceeded their PECOTA projections by more than 20 points of TAv. That corresponds to about the 10 percent tail of players who most exceeded their projections. This list of players who exceeded their performance in 2013 includes guys who excelled in the following year, like Mike Trout, Andrew McCutchen, and Carlos Gomez. It also includes players who were injured or fell off for one reason or another, like Wil Myers, Andrelton Simmons, and Avisail Garcia. On average, they outperformed their prediction by some 36 points of True Average, which is akin to the difference in offensive performance between Victor Martinez and Adrian Gonzalez this year. How’d they do in 2014? On average, no better than we’d predict, and substantially worse than they did in 2013. For 2013, these breakout players managed a .291 TAv, but the very next year, they were reduced to a .268 TAv, scarcely better than the league average of .260. This reduction is regression to the mean in action. The more a player exceeds expectations in Year 1, the less likely they are to return to those lofty heights in Year 2. Only by passing a player’s statistics through the lens of a projection algorithm like PECOTA can we get a true picture of their likely future abilities. It’s worth mentioning that injuries are a constant confounding factor and partial cause of this regression. True breakouts can be derailed at any moment by unlucky falls or extraordinary circumstances. Even with that noted, injuries are most likely to happen to older players and those with a history of prior problems. This ought to offer slim consolation to the eventual buyers of Martinez’s contract. The proper remedy would be to price Victor Martinez not on his 2014 success, but on the player he’s likely to be going forward. That’s a task easier stated than done, however. Even though breakout players don’t systematically outperform their forecasts in the next year, they do deviate from them to a greater degree, both positively and negatively, than you would expect by chance. These players are simply more difficult to predict. The task is made more dangerous still by the free agency bidding process. If we assume that each team has independent and slightly different projection systems, then they will all come to marginally distinct views on someone like Victor Martinez. At that point, it only takes a single team with an over-optimistic projection to drive a player’s price beyond reason. That team may win the auction for the player’s services, but, because their projection lies outside the consensus, they are also the most likely to have made an error in valuation (this paradoxical effect is called the winner’s curse). The result of the free agency process is that these breakout players are difficult and costly bets. Signing a premium free agent of Martinez’s caliber should only be done if you can acquire that player’s services at a serious discount, and even then, cautiously, remaining aware that the team from which the free agent is departing likely has the best, most complete information about their true talent. But all is not lost, and free agency is not without value. There is an upside to regression. By the same token which causes the best players to fall back down to earth, the players who have hit unexpected lows are likely to rise back to their long-term performances. Forget for a moment the marquee free agents who sat at the top of the leaderboards this past summer. Concentrate instead on the disappointments, the players whose fortunes unexpectedly and inexplicably sank. These are free agency’s bargains. The inverse of Victor Martinez might be someone like Chase Headley. Headley has flashed the potential of an All-Star, but is more realistically an above-average player. Coming from a nightmarish season in which he performed at replacement level, he offers upside at a lower price. And while teams may be cognizant of his latent talent, one runs a lesser risk in over-valuing him because the absolute amount of his contract will likely be low. A mistaken signing of Chase Headley is an irritation, not an anchor. This strategy was used to expert effect by Brian Sabean in signing Michael Morse, who came through in a big way during the championship run. Failing these low-upside contracts, there are other portions of the free agent market from which value can be derived. So long as international players stream in from overseas, there is uncertainty as to how to translate their work abroad into value in MLB. As players like Yasiel Puig and Jose Abreu have shown us, not even the most forward-thinking and analytically-minded front offices are close to having a good appraisal of players from some nations such as Cuba. Even if Cuban players become overvalued, there will be surprises from elsewhere. The crucial prescription is to avoid the big-ticket breakout players, at least when they are priced as such. Regression to the mean is an ever-present threat that not even MVP-level players can evade for long. Whether due to health, the adjustment of the league, or simple luck, players tend to fall (or rise) back towards their career averages, not their most recent performances. That’s not to say that bargains cannot be had this offseason, just as there were last year, or that on rare occasions, a player really does make a significant, mid-career improvement. But beware the players who suddenly catch up to a career year, for they are likely not as good, going forward, as advertised.